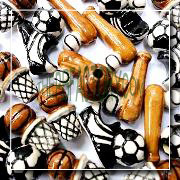 Peruvian Ceramic Special Sport Bead - Baseball Mitten. Size: 21 mm x 13 mm x 10 mm. Sold per bag of 25 beads.